We are excited by all the interest in Sky Spirit Shamans. We already have several people enrolled, and we are about 2/3 full. If you’ve been curious to know a little more about Sky Spirit or the Sacred Journey of the Medicine Wheel, this post is for you. We ground the structure of Sky Spirit Shamans in the Sacred Journey of the Medicine Wheel, an ancient map of consciousness that’s used by many traditions. Our journey through life may be conscious or unconscious at times, but we do go around the wheel either way. When we live the medicine way, consciously, we experience the seasons of life – growing up, aging, and dying – differently. We journey through and around the wheel, but we also have the capacity to remain in the center of the wheel, with 360 degree vision and the capacity to borrow from the gifts of the entire wheel in any given moment. We focus on the medicine wheel of the Inca, in part because their traditions were left largely preserved through the invasions of the Spaniards when the shamans and mystics fled into the mountains. It’s also the tradition in which I received my formal Munay-Ki sacred rites that I will share as part of the journey. We will fold in other medicine wheel teachings from our North American Ancestors as well. There are several key archetypes that guide and inform our journey, while supporting our expanding awareness and consciousness. We each develop our own evolutionary relationship with the archetypes, but this overview will help you to feel into them. Great Serpent, Sachamama, presents as a giant water boa. She is comfortable on land, where she connects heart-to-heart, belly-to-belly with our Mother Earth. She is comfortable in water, the place where we may heal our emotions and cleanse our sorrows from stories of the past. She helps us to shed our past – the way that she sheds her skin – to free ourselves from the bindings of our own stories, so that we may bring our energy into present time and stand in full empowerment. Snake medicine people allow themselves to be bitten many times, transmuting the venom into resilience and power. In essence, we may all transform our wounds into sources of power and compassion. She shows us the ways of the Wounded Healer. Jaguar, Ótorango, is the life force of the jungle, sitting at the top of the food chain. She teaches us to step beyond fear, violence and death. We have no need of enemies, and without fear there is only love. We free ourselves from family karma and drama, from our shadows and projections, and we experience a taste of the power of death and rebirth. Jaguar helps us to see the power of change and transformation, as we are always evolving, stepping from one life (phase) to another. She teaches us the way of the Luminous Warriors, the path of integrity and impeccability, creating our lives in peace within and without. Royal Hummingbird, Saywakinti, has the capacity to migrate thousands of miles without worrying about resources. So clever and resourceful, she will hitch a ride of the backs of larger birds. She teaches us courage and joy as we embark on this epic journey called life, which leads us back to our own source and our gifts we are here to express. We also meet the Hatun Layka, the Ancient Ones and Master Shamans. The lessons are spiritual, in that they teach us the practices of invisibility, learning to step outside of time/space and experiencing infinity. We explore destiny and deepen our connections to the star families. 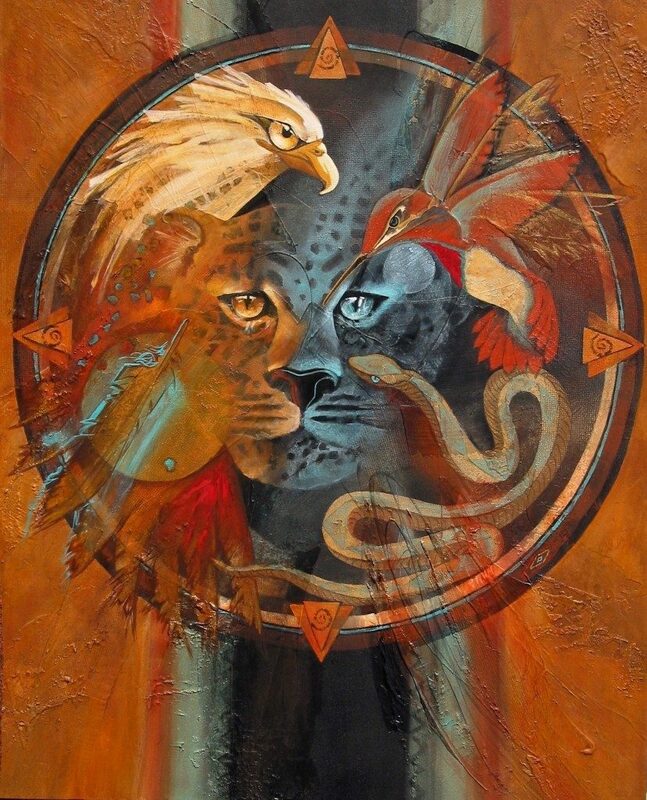 Eagle and Condor, Hatun Apuching, show us the way of the visionary. They hold the panoramic view of life to help us to find our guiding vision, beyond preoccupation with the storm clouds of life. Seeing our past and future, we know where we came from and where we are going. We explore possibilities beyond probabilities. We explore how to dream our world into being. We learn about our evolution and our transcendence, so that we take a quantum leap into who we are becoming. We learn to fly close to heaven, wing to wing with Tiqsi Texla Wiracocha, Great Spirit. We discover the maps to the afterlife, where our worldview expands vastly into the invisible realms. Alberto Villoldo, Shaman, Healer, Sage: How to Heal Yourself and Others with the Energy Medicine of the Americas (2000). This entry was posted in Channeling, Coaching, Community, Conscious Evolution, Healing, Relating, Spiritual Entrepreneurs, Spirituality and tagged Inca Medicine Wheel, shamanic healing, Sky Spirit Shamans. Bookmark the permalink. the posts are too brief for newbies. May you please prolong them a bit from subsequent time?